The subtitle of this work is ‘A Victorian vision fulfilled’. Throughout, the dual aims have been to define Benson’s vision for the stained glass windows of Truro Cathedral and to establish how that vision was fulfilled. This work of detection has confirmed Benson for the first time as the originator of the Master Scheme of 1887, and has also identified those who were responsible for completing his vision in the following decades. Benson saw the artistic representation of his concept of Unity in the stained glass windows as a fundamental part of the new cathedral. The didactic nature of the Master Scheme was the result of Benson’s passionate advocacy of his vision of Unity, and his view that such a robust response was essential to combat what he saw as the currently perceived threats to the Church. The Master Scheme for the stained glass windows was to be the aesthetic expression of the three elements of Benson’s Unity—theological truth, the reality of worship and the lessons of history. Even whilst the foundations of the new cathedral were being excavated in 1880, Benson, assisted by Mason, had already completed the broad outlines of the Master Scheme, and Pearson’s earliest architectural designs had been formulated to accommodate them. Quite rightly, whenever the architecture of Truro Cathedral is discussed, praise has always been given to John Loughborough Pearson, yet never before has Benson’s vision for the stained glass windows within Pearson’s architecture been fully examined and evaluated. Because there were so few subsequent alterations to Pearson’s basic designs the building became a veritable time capsule of the Victorian Age of 1880. It was a classic example of what Victorian High Churchmen such as Benson and Pearson thought a new cathedral worthy of the Glory of God should be, and how such a building should be the focus for a newly created Diocese. Pearson’s plans showed Truro cathedral to be an unashamed product of the Pugin-inspired Gothic Revival of the nineteenth century. However, even by 1880, this architectural style was definitely on the wane and by the time of the cathedral’s completion in 1910 was to all intents and purposes considered to be totally old fashioned. It is important to remember that the Victorian use of the Gothic Revival style implied an acceptance of the earlier Gothic principles and ethics.447 Pearson’s adoption of the Early English architectural style (with some French influences448) was ideal for Benson and Mason’s vision of the cathedral’s stained glass windows. The rose windows, with their theme of the Holy Trinity, afforded a spectacular opportunity for Clayton and Bell to produce some of their finest work. The great windows of the quire and sanctuary, with their massing of three or four lancets, enabled Benson and Mason to fill them with multiple panels of narrative and typological scenes, of a complexity and scale not seen since the medieval cathedrals in England and Europe. Significantly there is only one window where a narrative scene was allowed to spread over into adjacent lancets.449 One result of our exhaustive survey of all the windows has been an awareness that every detail in all of the windows is there for a purpose, and that nothing is there by chance. Here was the visual expression of Benson’s ‘search for theological truth’. The windows also served Benson’s vision for ‘the reality of worship’. Such complex subject-matter and iconography was entirely appropriate to the sacramental purposes of these vast spaces of the quire, transepts and nave, yet it was equally effective in the intimacy of the baptistry’s liturgical area. Finally, the all-pervading presence of single lancets throughout the rest of the building provided the third element of Benson’s concept of Unity— ‘the lessons learnt from History’. It was the ideal architectural form for a glazing scheme that told a multi-layered narrative of the whole of the history of the Church through the portrayal of individuals, singly and in groupings of three figures, with their accompanying narrative predellas. From a teaching point of view, each single lancet therefore could be studied individually without the distractions of being part of a multi-light window. This comment emphasises the aesthetic role of the stained glass windows. Yet, as we have seen, the layers and complexities of the Master Scheme exploited Pearson’s vast architectural spaces to maximum effect in order to portray Benson’s vision of Unity in terms of Truth, Worship and History. However, as we have seen, the qualms of the authors of the Master Scheme were unfounded, and their faith in Cornish zeal was justified. Despite the late nineteenth century economic depression throughout the county of Cornwall and the suspension of building for twelve years, Truro cathedral managed to find donors for a total of sixty-nine windows within the space of just twenty-six years. This in itself was an astonishing achievement considering that the overwhelming efforts for fundraising were directed towards the actual construction of the building itself, not for its fittings and fixtures. It has been estimated that the total building costs for Truro cathedral were in the region of £200,000. The prices of twenty five of the windows are recorded,454 and from that it is possible to extrapolate that the total cost of the stained glass windows (excluding those in St Mary’s aisle) would have been around £10,000, or 5% of the total building costs. Note that at this early date (1890) it was Mason who was controlling the negotiation between Worlledge, Chapter and the donor. Significantly, as in the later case of the Wesley window, the donor was offered an alternative window, but not a change in the subjects set down in Mason’s new version of the Scheme. The vision and the cathedral in the 20th and 21st centuries. National attention focussed on Truro cathedral with the pomp and ceremony of the foundation stones service in 1880, and the official consecration and benediction services in 1887, 1904 and 1910. Also, there were two further periods when there was major national interest in Truro Cathedral. The first was between 1878 and 1880, when Bishop Benson embarked on nationwide fund-raising campaigns, and there was much public speculation over the choice of the architect.458 The second period was during the national debate after Archbishop Benson’s death in 1896 on what would be the most suitable memorial to his memory. Sadly, after the cathedral’s completion and the First World War, both the building and its windows gradually slid from the nation’s consciousness for most of the twentieth century, eclipsed by the succession of new cathedrals at Liverpool, Guildford and Coventry. The enthusiasm for Cornwall’s cathedral shown by Cornish donors and patrons in the years up to 1914 seems to have somewhat evaporated in the following decades. One of the most notable features of the Master Scheme was the way in which Benson and later Mason used the windows to assert a sense of Cornish identity. Benson was always aware that the legacy of Cornish heritage was different from that of the rest of England. He deliberately chose to underline the differences between the new diocese and the old Diocese of Exeter: hence his emphasis upon the Celtic Christian origins in the county, and the inclusion of eminent Cornish figures in the Church History sequence. It is important to appreciate that the early date of the start of the Master Scheme (1878–1880) predates many other aspects of the ‘Celtic-Catholic revival’462, which later came to embrace art, the Cornish language and literature. We have also seen how the Cornish dimension of the window scheme was later enlarged by the Cornish industry windows, which looked back to a recent Cornish history, and forwards to the future prospects for the county. A deliberate intention behind the glazing scheme was to emphasise the authenticity of the Church of England as the true inheritor of earlier catholic traditions, in other words ‘the distinctive doctrine and practice of the English Church’. The new cathedral was built almost next door to one of the largest and grandest Methodist chapels in the county; they even shared the same dedication of St Mary’s, Truro. Externally the new cathedral dominated the earlier chapel; internally Benson and Mason’s cathedral windows proclaimed a loud and robust message about the pre-eminent position of the established Church of England. The creation of this unique Victorian vision in stained glass was entrusted to the studio of Clayton and Bell, whose skill and artistry is evident today in every window throughout the cathedral. The fulfilment of the vision was ultimately due to five inspired people, all of whom are duly commemorated in Truro Cathedral today. Statue of John Loughborough Pearson above the south transept door, holding a plan of the Cathedral. John Loughborough Pearson’s statue stands proudly above the south transept door, holding a plan of his cathedral design in his hand, and he is also portrayed in the foundation-stone predella in the Benson window. Sadly, there are only two memorials to his son Frank Loughborough Pearson, who took over as cathedral architect on the death of his father in 1897 and saw the cathedral building through to its conclusion in 1910 using his father’s plans.468 Besides the Boer War memorial, Frank’s reredos in St Mary’s aisle deserves to be given more prominence as it is his one artistic and architectural contribution to Truro cathedral in its own right. 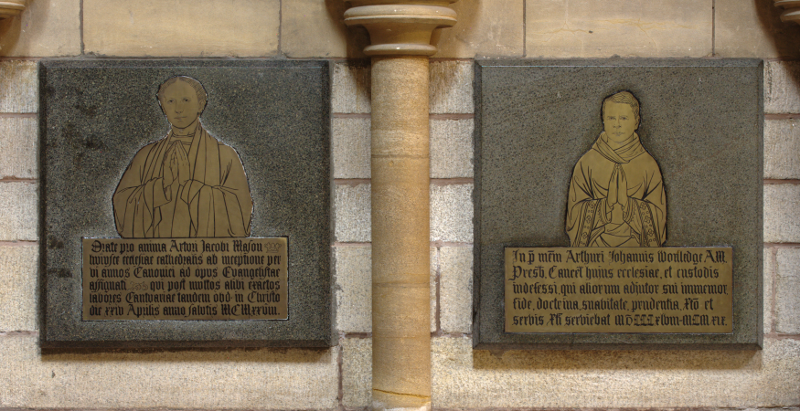 Commemorative brasses to Canons Arthur James Mason and Arthur John Worlledge beneath s4. We have also seen similar copious documentary evidence of the role Canon Chancellor Arthur Worlledge played in implementing Benson and Mason’s Master Scheme. Beneath the St James lancet s4 at the start of the Church History sequence are two small matching commemorative brasses. They portray youthful images of Canons Mason and Worlledge. It seems entirely appropriate that, on Mason’s death in 1928, the two people who more than any other had piloted Benson’s vision for the glazing and statuary of Truro Cathedral for over twenty-five formative years should be remembered together. Their dedication to interpreting and modifying Benson’s vision as the cathedral was completed was truly amazing, and has never before been acknowledged. Statue of Edward White Benson in the west front of Truro Cathedral, flanked by Bishops Wilkinson and Gott, second and third Bishops of Truro. There are many memorials to Edward White Benson in the cathedral, such as the brass in the Baptistry vestibule and his bust as Archbishop of Canterbury. He is placed centrally in the statuary of the west front and in the porch of the south transept. 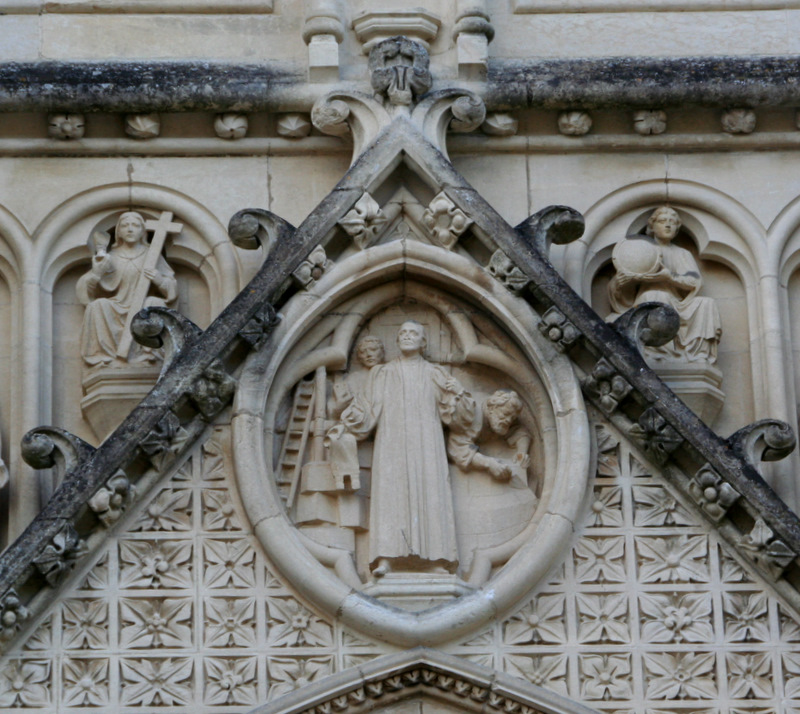 There is a little-known portrayal of Benson over the south door of the west front, where he is shown supervising two masons during the building’s construction. But it is at the Benson window n33 in the north nave that we started and therefore should end this work. Here he is portrayed overseeing the laying of the Cathedral’s foundation stone, and in the upper part of the window he is shown standing, flanked by the figures of Faith and Hope. It is entirely fitting that these two Christian virtues lie at the heart of his vision of Unity both for his new diocese and for his cathedral and its stained glass windows. Although his Master Scheme ultimately remains incomplete, his vision resulted in the largest and most ambitious Victorian stained glass window scheme in the country. 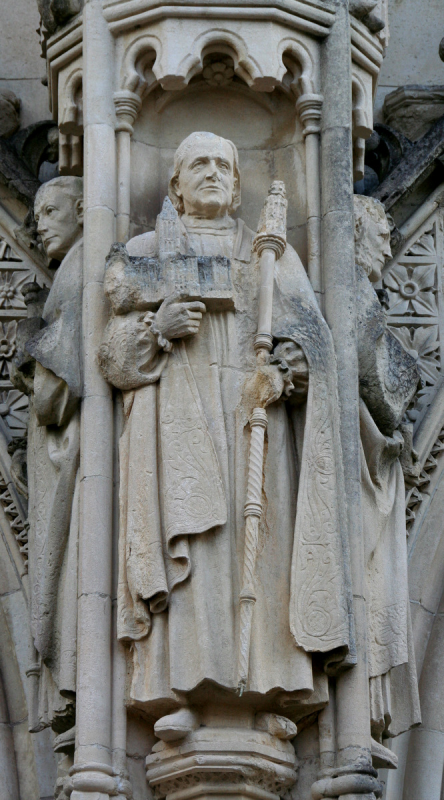 Statue of Edward White Benson over the south door of the west front, supervising two masons building the Cathedral. CCRO TCM/496— The Church Times 11th Nov. 1887. CCRO TCM/21/3 Printed Sermon preached by Benson at his enthronement—Truro May 1st 1877. Reprinted in EW Benson, Living Theology . Sampson Low, Marston & Company, London, 1893. The Bishop of Carlisle in JS Howson (ed) Essays on Cathedrals , London, 1872. Benson insisted on the towers and the rose windows and, as we have seen, the tracery for the rose windows was designed to incorporate Benson’s Trinity theme. CCRO TCM/151. Archbishop Benson’s diary entry 6th May 1895 on Pearson’s restoration of Bristol cathedral. The church of St Etienne, Caen in particular. Window S4 The Adoration of the Magi. J Betjeman Cornwall , London, 1964, p. 122. For these reasons, Betjeman regarded Annie Walke’s reredos in the Jesus chapel as a mistake . Cited on HMB 1 : p. 23. The costs of all the major windows are recorded. The average cost for a nave lancet was £100 to £120, and the smaller windows from £40 to £80. Grateful thanks for permission to use the results of Carrie Atkinson’s research on the Victorian glazing of Exeter Cathedral. CCRO TCM/1049/1 Letter from Canon Mason 6thNovember 1890 (7. Trinity Square) to Chancellor Worlledge. EW Benson The Cathedral—its place in the life and work of the Church . London, 1878. (1) Margaret ED Eustice The windows of Truro Cathedral , Truro, 1995. (2) An earlier undated guidebook on the windows had been written by Archdeacon F Boreham. (3) Canon Holroyd Mills was responsible for the signage of each window in the 1990s. There is some evidence that for the first half of the 20th century the Willis organ was not fully appreciated—the reference to the organ in mid-century official cathedral guidebooks was just one sentence. Philip Payton Cornwall, a history . Fowey, 2004, pp 266–7. The most well-known example of this revival was in the paintings of the Newlyn School, which did not start until 1882. A Dunstan ‘The Church near the People’, The Royal Institution of Cornwall Journal , 2000, pp. 125–153. Unpublished PhD thesis Exeter University by Canon David Miller The Umbrella and the Duck; the Episcopate of Bishop Benson 1877–1883 and the beginnings of Truro Diocese and Cathedral , 2012. ABD: p. 64 quoting Revd FW Newman, Vicar of St George’s Truro. CCRO TCM/21/3 Printed Sermon preached by Benson at his enthronement—Truro May 1st 1877. Frank Loughborough Pearson contributed to the completion of two other notable buildings designed by his father, namely 2. Temple Place, London for Lord Astor, and the first stages of the construction of Brisbane cathedral, Australia. Translated from the Latin by Oliver Padel.